"First there was his moustache, which we natives call 'handlebar' and gawk at admiringly. 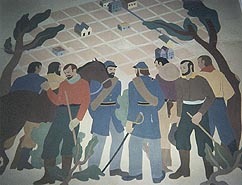 Next there were courthouse murals which he first designed. Although he dropped the project for private business, and many of his designs were not used, still . . . well, 'What do YOU think about the murals?' is a question guaranteed to enliven anybody's (sic) dinner party.'" [Idaho Statesman, date not certain] "Next Martin has furnished lively discussion over his portraits. Family and friends rattle on endlessly about whether they're too brutally true, too idealized, etc." [Idaho Statesman, date not certain] "In other words, the man Martin has a flair for mild furor. It's nice to have him in town. Or is it?" [Idaho Statesman, date not certain] Because the pay he received for his private commissions was more than he made with the WPA commission, he decided to withdraw from the WPA project and accept private commissions of painting well known Idaho family portraits. 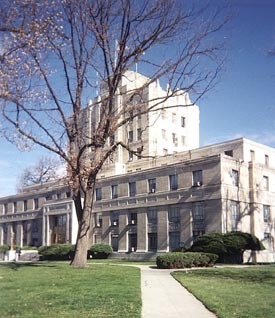 However, after the murals were completed by other artists, Ivan Bartlett and Jean Donald Swiggett, Martin Fletcher was interviewed by the Idaho Statesman and he stated that the murals were "acceptable, but certainly nothing to write home about." 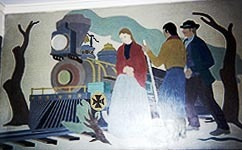 Martin Fletcher said the murals were painted by employees of the WPA art project in Los Angeles. "Martin originally designed them as a non-relief professional, but left the project when a change in regulations required him to spend more time than he felt he could spare from his private commissions and teaching. The murals were re-designed, and none of his genius appears in the finished product." [Idaho Statesman, date not certain]. "Martin said the project was under-financed and was 'railroaded through.' He said it was done in a hurry and mass produced resulting in formalizing and stylizing of the pictures." [Idaho Statesman, date not certain]. "Instead of a recognized artist like Martin designing the panels and doing the work with the aid of a few assistants, no fewer than 25 relief workers had a hand in the murals and the designer, 'a thoroughly capable muralist, probably didn't touch a brush to them.'" [Idaho Statesman, date not certain]. "As Martin originally planned the series of panels, they were to carry legends to explain the historical incident or motive they depict. These legends were omitted when the new artist took over the work and as a result Martin himself failed to recognize some of the panels." [Idaho Statesman, date not certain]. "'Many of the panels are meaningless without these legends,' he said, 'but this defect could be remedied easily by hiring a capable sign painter to sketch in some legends.'" [Idaho Statesman, date not certain]. Ivan Bartlett was born in Plainfield, Vermont on February 3, 1908; died in Andover, Massachusetts in July 1976. Bartlett studied at the Chouinard Art School, and was a resident of Long Beach in the 1930s. In the Who Was Who in American Art, the second edition is artists in California from 1786-1940, it states that Ivan Bartlett was an "illustrator, engraver, lithographer, painter, muralist. He "settled in NYC and was active through the early 1960s." Exhibited at the San Francisco Art Association, 1937, 1938; Oalkand Art Gallery [precursor to the Oakland Museum of California], 19038; Laguna Beach (solo), Los Angeles Museum [now the Los Angeles County Museum of Art', 1936-1939; Los Angeles County Fair, Pomona, 1938-1939; Golden Gate International Exposition, San Francisco, 1939; New York World's Fair, 1939. 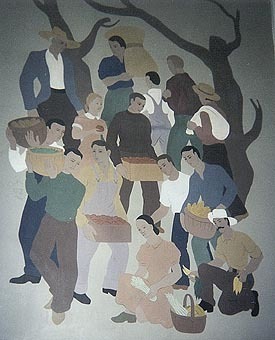 Awards: first prize, Los Angeles Festival of Arts, 1936; Jean Charlot prize, Laguna Beach, 1938; purchase prize, Los Angeles County Fair, 1938, 1941. Works held: Library of Congress; U.S. Postal Offices in Huntington Park and Redondo Beach; Long Beach High School. Listed in Who's Who in American Art, Volumes 3-8 (years 1930-1962; 1940-41, 1947, 1953, 1956, 1959, 1962). Ivan Bartlett had an assistant who helped him with the murals. His assistant was Jean Donald Swiggett. Jean Donald Swiggett was born in Franklin, Indiana on January 6, 1920, and died in San Diego, California on December 9, 1990. He also studied at the Chouinard Art Institute as did Ivan Bartlett, and he also attended Claremont Graduate School, San Diego State College (BA) and the University of Southern California (MFA). He was active on the (W.P.A.) Federal Art Project in the 1930s, and worked as art instructor at USC (1940-41); Washington State College (1941-42), and San Diego State College after 1946. He also moved to San Diego, California and was active in the California art scene, also winning many prizes from 1935 through the 1940s. His work included the Franklin, Indiana United States Post Office, and murals for USC and Polytech High School in Long Beach, California. He was a member of: San Diego Art Guild; LaJolla Art Association, San Francisco Art Association, Laguna Beach Art Association, San Francisco Museum Fine Art, 1938. He was mentioned in "Who's Who in American Art" volumes 3-10 (same as Ivan Bartlett, and also during the years listed of 1966 and 1970 included. Exhibited: Los Angeles Museum of Art, 1935-41, 1936, 1950; Golden Gate International Exposition, San Francisco, 1939 (oil, gauache). Awards: California State Fair, 1951; Los Angeles County Fair, 1951; San Diego Art Guild, 1950-54. Works held: San Diego Museum; USC (murals); Polytechnic High School, Long Beach, California. Bartlett (born 1908) was active in the New Deal art projects, working on murals in Redondo Beach, Huntington Park, and Long Beach. After the 1930's Bartlett moved to New York City. Address: Seville Ave and Zoe Avenue, Huntington Park. Description: A crowded scene of the local community at work and play along the harbor. Both Bartlett and Swiggett were alumni of the school.